What is a nutritional Quick Tip? A nutritional Quick Tip is a simple yet effective diet, supplement or lifestyle tip for you to learn and easily incorporate into your life, no matter where you’re currently at with your nutrition. Each Quick Tip is based on the newest, most relevant research in the area of nutritional science, and is inspired by information provided in academic medical and scientific journals. How do I receive Quick Tips? The Quick Tip of the week will be available to retrieve after 6:00 AM PST on the 1st day of the week. To retrieve your Quick Tip simply open the Quick Tip App. The Home page will appear with a button called “Quick Tip,” and to view the daily Quick Tip simply touch the button. You can also view your Quick Tip when you touch the Quick Tip icon in the navigation bar along the bottom. The research source is the scientific or biomedical article compiled by independent investigators from which each Quick Tip is created by our nutritionists. Each research source comes from a scholarly journal adhering to the strictest standards of scientific investigation and peer-review, and is translated by our nutritionists to provide the inspiration for each Quick Tip. How do I return to the Quick Tips App when I have clicked on a link that opened a browser window? You can opt to close your browser window, then press the Home button on your device. To return you to your app screen, touch the Quick Tip App and this will bring you back to the Quick Tip that you were previously viewing. Are the Quick Tips saved for future reference? Tips will be archived and categorized automatically on the Past Quick Tips list, and you can easily access Quick Tips when you touch the ‘Search’ icon on the bottom navigation bar. You also have the option to create your own personal list of favorites which are saved in your ‘myFav’ list. How do I view Past Quick Tips? Touch the ‘Search’ icon in the bottom navigation bar to bring you to the Category list. From there you can select a Category which will bring you to the Subcategory list. Then you can select the Subcategory, which will bring you to the tip list, and the last step is to select the tip that you would like to view. You can also use the ‘Search’ functionality on the Subcategory or tip list to find a specific tip. To do this, simply enter a specific keyword in the search window to limit a search to the subcategories or tips that contain your keyword and then touch ‘Done’ on the keyboard. How do I add a quick tip to my favorites? When you display the Quick Tip you can save it to your favorite list when you touch the button “Add to my Favorites”. To access your list of favorite tips simply touch the “myFav” icon in the bottom navigation bar. How do I remove a quick tip(s) from my favorites list? Touch “myFav” icon to view your list of tips, and to delete tips you have a few options. 1. Touch the ‘Edit’ button on the top right, then touch the individual red symbol beside the tip you wish to delete. The ‘Delete’ button will appear on the tip, touch the button to delete, then touch the ‘Done’ button. You can use this feature to delete multiple tips at once. 2. To delete all your favorite tips, touch the ‘Clear All’ button on the top left. You will be asked to confirm to remove all your favorite tips. Note: Once favorites are deleted they will no longer appear in the list, and you can add the individual tips from the Past Quick Tips back into your favorites using the “Add to my Favorites” functionality”. Do I have to register to receive Quick Tips? What does Share the Quick Tip App mean? When you hit Share the App icon, the App information will post to your Facebook page to share it with your family and friends. 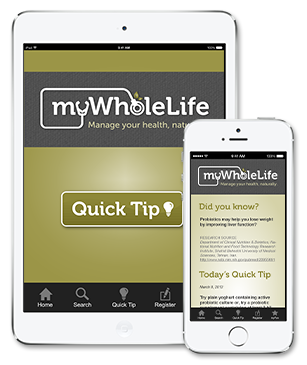 To learn more you can link to the myWholeLife.ca website from the Quick Tip page or go directly to the website from you preferred web browser on your iPhone, iPad or computer. The Quick Tip app was built to operate on iOS Version 5.1 and above for iPhone 3GS, 4, 4S, and 5, iPod touch (3rd & 4th generation), and iPad (1st, 2nd, and 4th generation) and iPad 2., and version 2.3 for Android. Please ensure you are running the specified version or higher to ensure optimal performance. Where are quick tips stored? Does any data get stored on the my device? The weekly Quick Tip and Past Quick Tips are stored remotely on our database and are accessed when you open the Quick Tips App. The tips that you opt to add to your favorites (myFav) will be stored on your mobile device.